Q: You say that, “I’ve got the greatest job in the world. My worst days as a photographer might be the greatest days in the lives of many people.” What is it that drives your passion for photography? As a photographer, you see the best and the worst of humanity. You’re lucky when you’re able to witness the best. But when you see the worst, you truly realize how fortunate you really are. Every day is a different experience and as a photographer I’ve had so many different and great experiences. I’ve gone from photographing former Federal Reserve Chairman Alan Greenspan to shooting Rapper DMX, been able to tell the world’s richest man what to do, had the best seat in the house at Super Bowls, NBA finals and the Olympics and gotten drunk with George Clooney – well, ok, I suppose a LOT of people have gotten drunk with Clooney. But I’ve also witnessed poverty, murder and famine. Compared to such hardships, any difficulties we encounter in the course of a photo shoot really pales in comparison. If I ever get frustrated dealing with a particularly difficult Hollywood publicist, I remind myself that after being shot at, clubbed and tear-gassed, how bad can this be? Q: You won the Pulitzer Prize for Spot News Photography for your photographs of the 1984 Los Angeles Olympics. What do you think made your photographs stand out from the competition? It was one of those David-and-Goliath situations where it’s always best to be David. I was right out of college working for the Orange County Register and we had three credentials to cover the Olympics, while our competition the Los Angeles Times had 28. We simply didn’t have enough bodies to stand shoulder-to-shoulder with them at the finish line of every race. Ultimately that became our blessing. Instead of standing in the pack at the finish line, we were freed to search for fresh vantage points. Some of my best photos were taken crouched at the feet of the paying customers in the grandstands. Q: What other events / experiences would you describe as turning points in your career? Q: Are there any people who have had an influence on your career? One of the people who had the biggest influences on my career was Ron Mann the Director of Photography at the Orange County Register. Ron pushed the photo staff to “Swing for the Fences” as they say in baseball. What he meant by this was rather than to just settling for the safe shot. He wanted us to go all out and take chances to come back with something great. There are plenty of editors who expect greatness, but Ron would always have your back if you tried for something great and failed. I didn’t realize how lucky I was at the time, but that created such a wonderful atmosphere on the staff that we came out of nowhere to sweep many of the major awards for newspaper photography. Q: You have photographed many celebrities, from Bill Gates to Richard Branson. Are there any experiences you would like to share with fotoflock members? Those are great examples because they illustrate just how different every shoot is. As a portrait photographer the best thing can learn is how to relate to different personalities. Bill Gates is extremely introverted and quiet, yet he’s cooperative, so the key to our shot was just putting him at ease and telling him what I needed him to do. Because we took a low-key approach, he was even happy to step out of his comfort zone and agreed to everything we wanted. Q: You have shot both famous and infamous celebrities. How do these experiences compare? Everyone is different. In some ways shooting famous people is a lot easier because the viewer already knows something about them and photographs of the truly infamous illicit a response based more upon their personalities than the photograph. I suppose the challenge of photographing un-famous people is how to convey their personality to someone who knows nothing about them. Q: Tell us about your appearance on the Fine Living Network’s Me vs. Me: Sports Photography in which you taught a Little League Mom to become a Big League Sports Photographer. 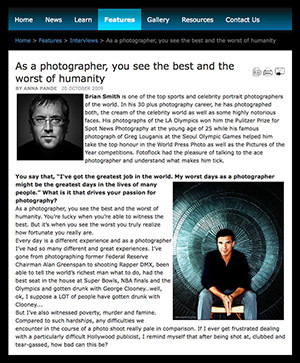 Q: In addition to being a professional photographer, you are also a frequent speaker at photo seminars and colleges, universities and art institutes as well as the President of Editorial Photographers (an organization of over 2,000 of the top magazine photographers and newspaper photojournalists from around the world). How do you balance these different aspects of your career? I do it to give something back to a profession that’s been very good to me. But to be honest it’s a tough balance at times. My wife has to remind me at times that my paying jobs take precedence over my unpaid gig. Q: Your wife is a stylist and make-up artist. Does she help you with your shoots? We collaborate on everything. She brings so much to every shoot. We’ve been working together on virtually every shoot for the last 17 years, which makes me the luckiest guy on the planet! Q: You are famous for your sports photography and celebrity portrait photography. What do you think is the secret to excelling in these fields? Q: What are your thoughts on printing and what printing equipment would you suggest for best results? The current inkjet printers from Epson, HP and Canon are all really amazing. I’m printing with Epson’s 4880 and 2880. My paper of choice is Moab Entrada rag paper. I discovered Entrada a few years ago when I was testing double-sided papers for a portfolio that I was printing. I ran a test with every double-sided paper that I could get my hands on. Moab Entrada and Kayenta were the clear winners. I’ve been using Moab ever since.